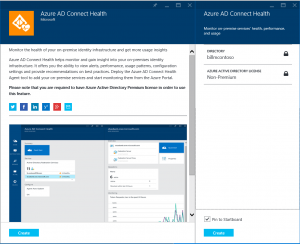 Azure Active Directory (Azure AD) Connect Health helps you monitor and gain insight into your on-premises identity infrastructure. It offers the ability to view alerts, performance, usage patterns, and configuration settings. It also enables you to maintain a reliable connection to Office 365 and much more. For more information see Azure Active Directory Connect Health.